Cleaning your dogs ears regularly is essential if they're to stay healthy and free from infection and disease. These 7 simple steps will help you to keep your Cocker Spaniel's ears healthy and bacteria-free. It's an understatement to say that Cocker Spaniel ears can be pretty high maintenance, that's why cleaning your dogs ears at least once each week is paramount! Because of their pendulous design, their ears often trail across the ground, picking up all sorts of debris and trailing through who knows what. 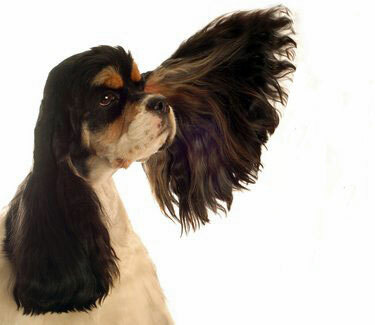 And because the ear flap closes over the ear canal, trapping in warm moist air, Cocker ears are often susceptible to many infections. However, if you keep them well-brushed and scrupulously clean you can help to avoid infection in the first place and keep them bacteria free and healthy. Why not try these 7 simple steps to cleaning your dogs ears? You could easily add them into your Cocker's regular grooming routine. Essentials To Keep Your Dog's Ears Clean! a couple of treats for a well-behaved Cocker Spaniel. You'll find a selection of very good ear cleaning solutions in most reputable pet stores, but you may also find that one or two that can be drying to the ear. It's simply a matter of trial and error. Use a brand that you trust or alternatively you could ask your vet to recommend a product to you. Ear problems can be quite stubborn once they take hold so there's really no point in taking risks where your Cocker's health is concerned! Before cleaning your dogs ears, wash your hands thoroughly to avoid transferring bacteria from your hands to your dog. Ask your Cocker to sit while you carefully inspect the inside of each ear. They should be clean and pink, with no waxy discharge and there shouldn't be any bad smell. A little brown or blackish/brown wax is fine so long as there's no unpleasant odor. Max often gets brown wax in his ears now and then (they just smell 'doggie' not 'yeasty') and I just give them an extra clean and a quick check each day to make sure there's no infection. Squeeze a few drops of your favorite ear-cleaning solution directly into your pet's ear and massage the base of his ear for a minute or two. My Cocker really loves this bit and will let me continue rubbing for ages. But be warned...when you stop massaging his ears he'll probably shake his head and cover you in solution and wax! For cleaning your dogs ears (externally, around the ear canal) you only need to pour a few drops of solution into a small, clean dish (the lid of an old jam jar works fine, just remember to sterilize it first with boiling water). If you use cotton buds on your pet's ears, it's very important that you don't push it too far into the ear as this could seriously damage your pet's ear drum. Gently rub the inside of your Cocker Spaniel's ears to remove any wax, dirt or solution (shaken out after the previous cleaning). Working from the inside of the ear out towards the outside edge, remove as much dirt and debris from his fur as you can. Dip a cotton bud into the ear-wash solution and gently clean the folded parts of your Cocker's ears. If you decide to use a medicated powder, now's the time to use it. Bacteria loves a warm damp place so always dry his ears after cleaning to help keep bacteria at bay. Use a dry tissue or cotton bud to remove any residual ear-wash solution and/or medicated powder. 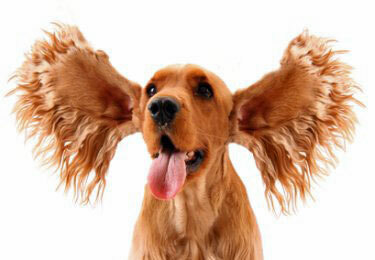 Removing excess hair from around the opening to your dog's ears can help the air to flow better inside the ear canal. You may need to use a puff or two of medicated powder to help you grip the hair if it's too waxy. The more air you can circulate, the better chance you have of reducing moisture levels in your dog's ears, which in turn will create less of a breeding ground for bacteria. When cleaning your dogs ears, it's best not to re-use a cotton wool ball or bud in your dog's other ear; throw it away after use to help stop cross infection from one ear to the other. Talk quietly to your Cocker while you're working to help keep him calm and reassured. When you've finished, and if he stayed (relatively) quiet and behaved himself throughout, praise him and give him one of his favorite treats! Following the above guidelines will help to keep your precious Cocker's ears healthy; free from mites, bacteria, yeast, and viruses, which otherwise could lead to serious infection and misery for your boy. 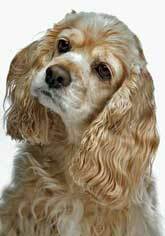 You can learn more about ear infection in Cocker Spaniels here. If you'd like to read more about the symptoms of ear infections in Cockers and how to spot the signs, simply click on the above photo. 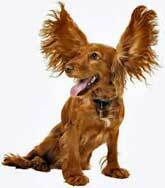 If you'd like to understand more about Cocker Spaniel's ears and their general maintenance, click on the photo of this cute buff cocker above.